So, continuing on our travelogue....I hope you're enjoying the pictures as much as I enjoyed taking them and seeing all of this firsthand. We were so thrilled to eat in the same restaurant that President Obama and his family ate in....and, in the EXACT same room...Our guide Carlos sat in the Obama chair!! It's a family-owned restaurant called San Cristóbal Paladar. there are pictures of him and the family all over the room. but, of course, we went to galleries where there is always something for everybody. In front of a local restaurant...lots of gnomes! Don't worry...We're still keeping an eye on the strays! Yes, you saw it here !!!! 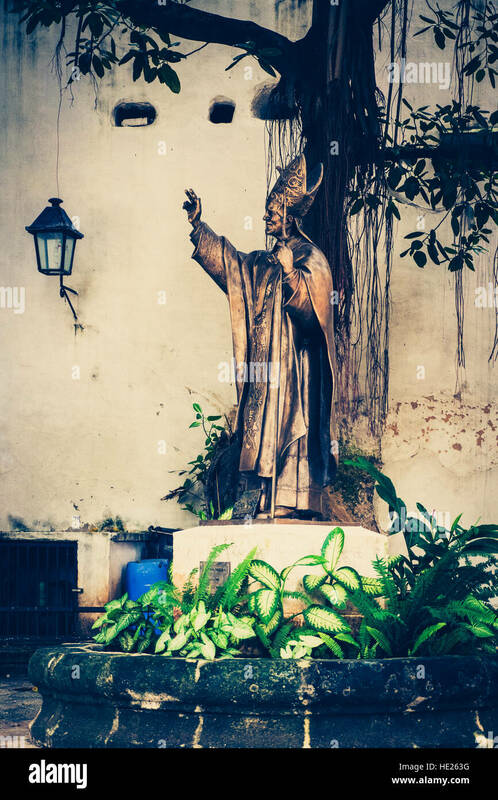 A statue of Pope John Paul the 2nd in a courtyard in a church in Havana. This was all hand made paper. This sculpture on the grounds of Castillo de la Real Fuerza resembles the 1490 drawing by Leonardo de Vinci called Vitruvian Man. Lenny took this lovely picture of the sunrise (or maybe it was the sunset...who remembers??!!?? LOL) at Morro Castle (built in 1589) which was named after the three biblical Magi. The fortress is guarding the entrance to Havana bay in Cuba. In Spanish "morro" means a rock which is very visible from the sea and therefore serves as a navigational landmark. We visited the morro a few times for pictures, sunrise and sunset. It's definitely a place you don't want to miss. Cuban artist José Fuster’s art is “naïve,” meaning he uses childlike crude shapes and bright colors in his untrained composition. His work has been compared to that of Picasso, a comparison that followed him in successful gallery tours across Europe. Makes you think of Gaudi and Barcelona, doesn't it? Fuster wanted to put his artistic reality into his real-world surroundings, and he began in his own neighborhood. Fuster began decorating his home in 1975 and his project grew to include his neighbors and professional offices around him. There is no charge to visit, but Fuster and his neighbors (many of whom have become artists as a result of his work) will surely appreciate you buying any of their works, small or large. We were so fortunate to visit The Cuban National Ballet School (Escuela Nacional Cubana de Ballet) which has approximately 3,000 students and is the biggest ballet school in the world and certainly the most prestigious ballet school in Cuba. It is directed by Ramona de Sáa. And, here's the kicker....Like all the Cuban educational systems, the education of the ballet in the country is free. You enter this beautiful building, with its many staircases, (no such thing as elevators...you have to be prepared!) and we come to one of the beginner classes. Young students of perhaps 7-10. In addition to studying ballet, they also have a full course of regular schooling as well. Not easy taking pictures of 'moving objects'! Their teacher is very demanding and strict. The school originally held only 900 students but it was Fidel Castro who, in a visit to the school, suggested the idea of new studio space and, after several proposals, it came to be. Thousands apply but a committee chooses only a handful of promising students many who go on to belong to the National Ballet of Cuba and tour worldwide. We then moved up the stairs to watch older students practice. When the children break from the classes they meet up in the hallway and wait for instructions for their next class or lunch. Ballet wasn't the only craft we saw. On a different day, we got a first-hand look at how Cuban boxers train in an open-air setting. You enter this little out of nowhere spot....There are few boxing rings that are more unique than the Rafael Trejo gym in Old Havana. It is sandwiched between deteriorating apartment buildings. It is home to some of Cubas elite athletes, as well as a training ground for young champions to be. Their trainer is also well known. And, yes...the girls and the guys spar together. Whether you are an old-timer or a novice, everyone trains together. From 1968-2000, Cuban boxers, many with links to Rafael Trejo, won more Olympic medals than any other country. The day we arrived in Havana I just knew it was going to be a fantastic trip. The weather was great, I saw lots of old classic cars right away and the people were hustling and bustling all around me waiting for their arrivals. Now, most of you know that I love leaving little "ART ABANDONMENT" necklaces and artwork wherever I travel to. I came with 10 small necklaces using Memory Frames (from my Ranger days), chain from various jewelry sources and photos that I found online and reduced to fit a 2X2 frame. You just pick a spot when no one is looking and place it.....then, walk away. Once or twice I have seen them picked up but usually, I divorce myself from waiting around because the point is 'to abandon them, with abandon. But the best part of 'art' is seeing what other people do We got to visit the Taller Experimental de Grafica de la Havana where you can see Cuba's cutting-edge art workshop, unique. for its engraving processes. The artists' co-op allowed you to take pictures of their work and to buy. We loved this crazy cat collage from artist Carlos del Toro. He uses cigar wrappers and other interesting local papers in the piece, which is on canvas. Naturally, we bought it! Here are some snaps from other artists in the co-op. These views provide a look at their mono printing techniques, collage techniques, inlays and the various machinery and tools they use. Upstairs in the studio is a lovely space with newspaper flowers hanging from the ceiling and various potted plants placed randomly around the space. Yes, these are all made from newspaper. and, as always...there are stray cats and dogs everywhere just waiting for food or attention! My emails indicate you guys are enjoying the pictures from the trip...so...there will be more coming, of course! It's always polite to ask people if you can take their picture, but, sometimes you just can't resist the urge to snap "the moment" before it disappears. So...my humble apologies to those whose faces may show up on this blog that I wasn't able to ask....you were all loved or I wouldn't have taken your picture! In many cases, however, we tipped the people whose pictures appear because, that 1 peso or so, is a lot of money to them and we were more than happy to contribute. Here's one of my favorite snaps....this gentleman in the barber chair, was very patient while I shot numerous shots all on different settings in the camera and wound up loving this particular one. I purposely left my large SONY DSLR (& all the lenses) at home and only used my Canon SX60HS with a fixed zoom lens and my iPhone 7+. I just flipped over the blurry effect I got with my camera while his face stayed in focus. The Malecón (officially Avenida de Maceo) is a broad esplanade, roadway, and seawall which stretches for 8 km (5 miles) along the coast. Kids and fishermen and ordinary people hang out there day and night and it always provides a wonderful backdrop for people pictures. Lenny never took picture taking seriously before this and he shot a few of these as well and loved the whole process. I caught these 3 pictures below with my iPhone and a filter...they turned out to be one of my favorite series. This was a very special type of trip. We went with a small group of photographers, led by Jim O'Donnell a professional photographer from Taos, NM, and a highly personalized Cuban guide, Carlos Enrique González, both representing Espiritu travel based in the U.S. So with Jims' knowledge of photography (based on his past visits to Cuba) and Carlos' tremendous presence in the community we went into every area imaginable. Good, not so good and all the etceteras! Needless to say, I took bazillions of snaps! No time to put them into Lightroom or Photoshop or even in iPhoto.....just wanted to get them out to you to enjoy. There are much more coming....architecture, galleries, more interesting people, street art...just keep coming on back! It's nice to be back on the blog again ! It's been almost a year since I last blogged but there is so much to share about our recent trip to Cuba that this seemed like the perfect place to get it going again. I'll try to post a few pictures from different categories...today we're going to see what Havana is so famous for... OLD CLASSIC CARS ! It's like being in the land that time forgot. The city of Havana is itself colorful and yet dusty and decaying, but, these amazing vintage cars are used by almost everyone on a daily basis...many as taxis, and are shiny and bright and well taken care of like the priceless objects they are. The cars can be seen all over the city. Raul Castro has made it possible now for anyone to buy these cars without permission like they used to have to get when his brother was in charge. Many of these cars have been put back together with a hodgepodge of motors, mirrors and the like. If you look very carefully at the snap below....you'll see I'm in this hot pink car ! We arranged to have one take us all around old and new Havana and it was a fantastic tour. Cubans travel back and forth on the island, many carrying hard to find items to fix their cars. This "car" below is called a "CoCo" Taxi...and as funny as it looks it can go pretty fast and lots of tourists take them back & forth to their hotels. I drive a convertible at home....but this cracked me up!! A REAL ragtop if ever there was one ! Tomorrow we'll get to see more of the very wonderful trip.